The city of Windsor, Ontario Canada and the Air Force Club of Windsor are honouring veterans through a special walkway. For a donation of $35.00 Canadian a veteran's name or a message will be sandblasted into a grey 8"x8" brick then filled with black grout. A Veterans Section at City-Hall Square Cenotaph is going to be for VETERANS ONLY - Army, Navy, Air Force and Wartime Merchant Marine including those "Killed-In-Action". Bricks will be suitably located in areas designating their branch of service. In Memory of My Daddy my mother and I have purchased a brick in his honour. He fought in the Netherlands during WWII for the freedom of everyone and because he became a Canadian citizen and loved this country we felt it appropriate to have him remembered here for what he did. 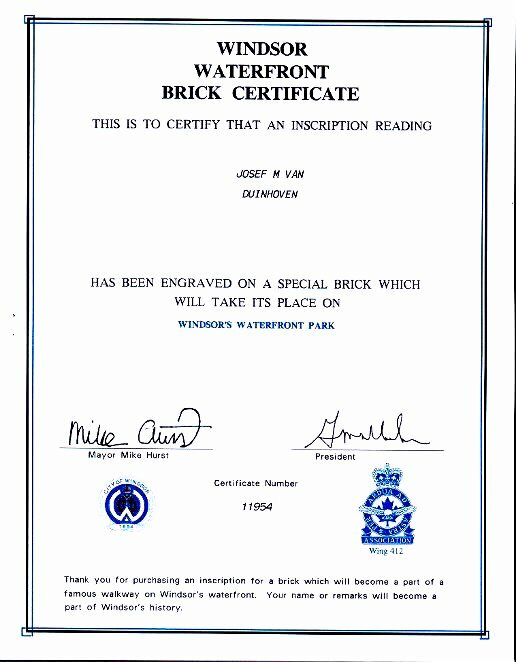 This is the certificate we received to commemorate the engraving of the brick.